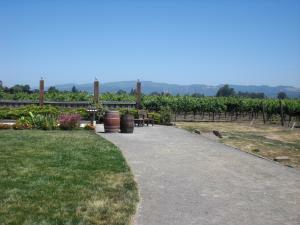 Wine Recommendations for May 2011, A Toast To Spring! Ah, wine recommendations for May 2011 lure us into a summer state of mind. Though we are still a few weeks away from the official start of summer, our mind is already there. May means Mothers' Day, it means warm evenings with friends, and it means the end of a long hard winter. Enjoy these wines at your spring barbecues and sunday brunches, as you eagerly await the promise of the warm months to come! Columbia Chardonnay Columbia Valley 2008. Refreshing notes of citrus, apples, and spices. Score of 87, $11.00 USD. Washington State. Mphua Sauvignon Blanc Marlborough 2010. Notes of tropical fruits, citrus, and flowers. Crisp yet smooth. You'll really like this one! Score of 88, $13.00 USD> New Zealand. Viu Manent Chardonnay Casa Blanca Valley Reserva 2010. Notes of apples, citrus, and melons. Score 87, $13.00 USD. Chile. Domaine La Croix Belle Grenache-Viognier Cotes de Thongue Le Champ des Lys 2009. Spicy and fruity. Notes of apples, pears and citrus. Score of 89, $13.00 USD. France. Castle Rock Syrah Columbia Valley 2008. Juicy and zesty. Notes of berries and orange peel. Score of 88, $11.00 USD. Washington State. Buehler Zinfandel Napa valley 2009. A lovely wine. Notes of herbs and berries, with a touch of vanilla. Score of 91, $18.00 USD. California . La Vinsobraise Vinsobres Sélection Vieilles Vignes 2008. Notes of plums and cherries with a bit of anise. Score of 88, $15.00. France. Viña Santa Carolina Cabernet Sauvignon Maipo Valley Reserva de Familia 2008. What a Cab should be! Notes esspresso, plum, fig, and tobacco. Dark and intriguing. Score of 89, $17.00 Chile. Enjoy Spring With Wine Recommendations For May 2011!